1. Brand New: 100 new recipes for slow cookers. 2. Brand New: “Prep Time,” “Cooking Time,” and “Ideal Slow-Cooker Size” are included for each recipe. 5. Brand New: Additional tips and tricks for making the most of your slow cooker, spread throughout the book. 6. Brand New: A second color—a rich purple—for recipe titles, contributors’ names and addresses, the words “Tip” and “Variation,” and the numbered instruction steps. 7. Brand New: The drawings on the opening pages of chapters and the spot illustrations throughout. 8. Brand New: 1 page of tip-in color, right inside the front cover. 9. Brand New: 2 pages of review excerpts to position the original book’s success, immediately following the tip-in page of color. 10. Revised: An improved Index! 11. Revised: A personal Introduction to the book by author Phyllis Pellman Good. 12. Revised: Good’s personal comments and voice throughout the recipes. If you are a fan of slow cooker recipes, then I'm sure you are familiar with author Phyllis Pellman Good. She is basically one of the queens of slow cooker recipes. 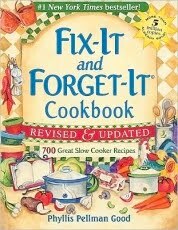 Her latest cookbook, FIX-IT AND FORGET-IT COOKBOOK: 700 GREAT SLOW COOKER RECIPES, is actually a revised (and improved) edition of one of her older cookbooks. As someone who was familiar with that cookbook, I think this one is even better. It's definitely more current and useful! I think slow cookers are truly a god-send for many working and busy moms. 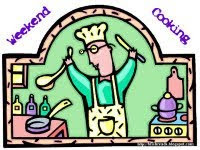 As much as I want to use these recipes more often because of our busy schedule, unfortunately, I find that I rarely do. One reason is that I just don't start thinking about dinner until late afternoon, and slow cookers do require a little planning. But I think the other reason is that my family is just too darn picky. Between my two fussy eaters (and my son with food allergies), it's hard to find something the whole family will eat. Having said that, I did find a lot of recipes in FIX-IT AND FORGET-IT. Of course, there are 700 recipes so every one's bound to find some that look good. The cookbook is actually a compilation of many slow cooker recipes from individuals. I always think cookbooks where people submit their favorite recipes are the best because you know they are sending in their tried and true favorites. The cookbook is divided into pretty typical sections-- appetizers, soups, main dishes, vegetables, desserts and beverages. I was pleasantly surprised by how many appetizers, including dips, that were included in this cookbook. I love the idea of using my slow cooker when entertaining -- especially because it keeps my oven free for other things. I also liked many of the soup, stew, and chili recipes that were included. I tend to think these types of recipes just lend themselves to a slow cooker. The real meat of this cookbook (pardon the pun) is the section for all of the various meat dishes. There are loads of recipes for chicken, beef, pork and turkey. There are also sections on bean dishes as well as meatless main dishes. In addition, there is a big section for vegetables and sides. Regardless of the ingredients, all of the recipes are very simple and include normal ingredients. The dessert section isn't huge, but I did find some yummy sounding desserts such as puddings, bread puddings, and cakes. I admit that I'm very curious to try a cake that's made in a slow cooker -- how cool would that be? I also liked a few recipes in the beverage section including the hot punches and the almond tea. Because of our evening activity schedule, I thought I'd try Cheryl's Macaroni and Cheese. It only took about 10 minutes to throw together which is always a plus for me. In my effort to make healthier versions of dishes, I used fat-free evaporated milk, skim milk, and 2% cheese for half the cheese in the recipe. I thought it was tasty, but my husband and daughter didn't love the texture. I'm not sure whether it was because I substituted the low-fat ingredients, or if they just didn't like crock-pot mac and cheese. I also thought maybe it was a little overcooked. It was supposed to cook between 3 and 4 hours, but I would try the shorter time if I make it again. Ideal slow-cooker size: 2 1/2-qt. 1. Combine all ingredients, except 1 cup cheese, in greased slow cooker. Sprinkle reserved cup of cheese over top. 2. Cover. Cook on Low 3-4 hours. Do not remove the lid or stir until the mixture has finished cooking. Overall, I think the FIX-IT AND FORGET-IT cookbook is a must-have for anyone who uses slow cookers or wants to use slow cookers. It has so many delicious recipes that I'm sure you'll find quite a few that appeal to you and your family. I love using my slow cooker, particularly in winter. I really need to find a really good cookbook for it. I just bought a huge slow cooker cookbook with the anticipation of football season in August. They practice freaking five days a week! I warned my husband he was going to be eating crock pot food every night for months. Once I've plowed my way through it, I'll have to do a post. I don't use my slow cooker all that often because it's huge! I need to buy a slower one. It might have been the low fat cheese that changed the textured, because I've had delicious mac and cheese from a slow cooker before. I have the "original" version of this book, as well as the entertaining book, and enjoy both of them. The recipes are easy, quick, and tasty. A culinary home run in my household. Sounds like a really good cookbook. My kind of cooking. LOL. The mac & cheese one you shared sounds delish. I have the original version and if you saw my copy you would know how often it was used. It is full of stains and dog-eared pages. I love it and have my favorites from there. I may have to check out this revised version! I just became a single dad and need some recipes that don't take a lot of time. A co-worker suggested using a slow cooker. I need some recipes. I think this cookbook is just what I'm looking for. I am thinking the low-fat dairy products may have changed the texture. I've heard great things about this cookbook. I go through stages of using my slow cooker.